I won’t say all too much about this image, since it is meant to be a preview of what is to come. 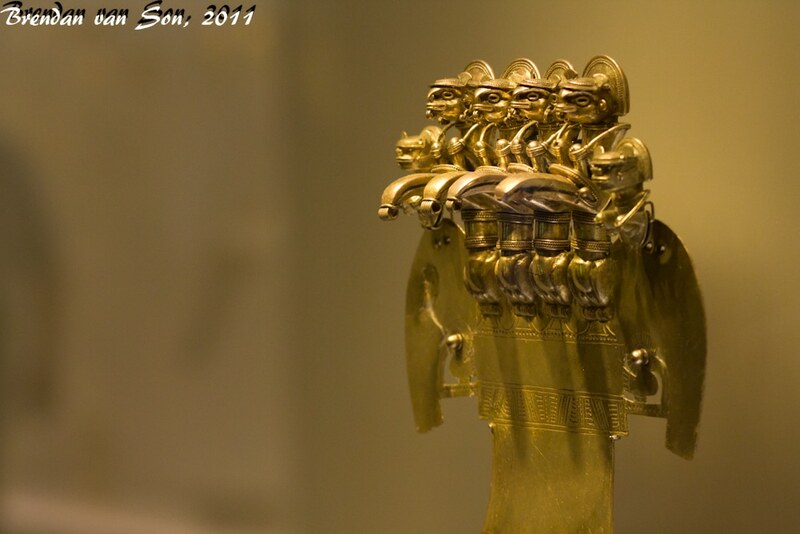 Tomorrow I will be posting a photo essay from the famous Museo de Oro in Bogota, Colombia. This is one of the top museums in all of the Americas, and if you’re in the area it is a place that you should be visiting. The collection of Pre-Colombian gold is the largest in the entire world and has nearly every single visitor constantly saying “wow, look at that!” Beyond the obvious beauty of the pieces in this museum they offer great historical insight into the history, culture and tradition of the people that lived on the continent before the arrival of Europeans. My post tomorrow will be a little bit more than a simple photo essay, but will also be a history lesson of sorts, and I hope that you like it. Museums are very difficult to photograph. Most of the items are hidden behind glass windows that cause reflections and not to mention the dark conditions and the inability to use a tripod. There are some tricks, however, that you can use while photographing in museums. The first is to pack a monopod. The reason that tripods aren’t allow in museums is because they get in the way, a monopod, however, doesn’t get in the way at all. It will give you the stability you need to shoot in the low light and it will be allowed in basically any museum in the world that cameras are allowed. The second piece of advice is to use the lighting conditions to your advantage. The use of light is essentially what photography is all about. Poor lighting doesn’t have to be your enemy, examine the light and decide how you can use whatever light you are given to broaden your creativity. Don’t look at these difficult photography situations as a pain, look at them as a chance to challenge yourself to become a better photographer.